Documentary as self-therapy, the Oscar-nominated Minding the Gap arrives in the UK this week following a flurry of State-side plaudits – all of which are entirely justifiable. Chronicling the lives of himself and two friends from teenage years to young adulthood, director Bing Liu has crafted a rich coming-of-age odyssey which is, in turn, illuminating, sobering and ultimately uplifting. The Chinese-born, US-raised filmmaker was quietly chipping away at his pet project for well over a decade, taking camera assistant gigs on industry features and TV whilst crafting his own feature on the side. His efforts have paid off magnificently, and like Jenny Gage’s similarly celebrated 2017 farewell to adolescence, All This Panic, Liu is able to engender much empathy from the key figures in his film, not least because he’s also one of them. 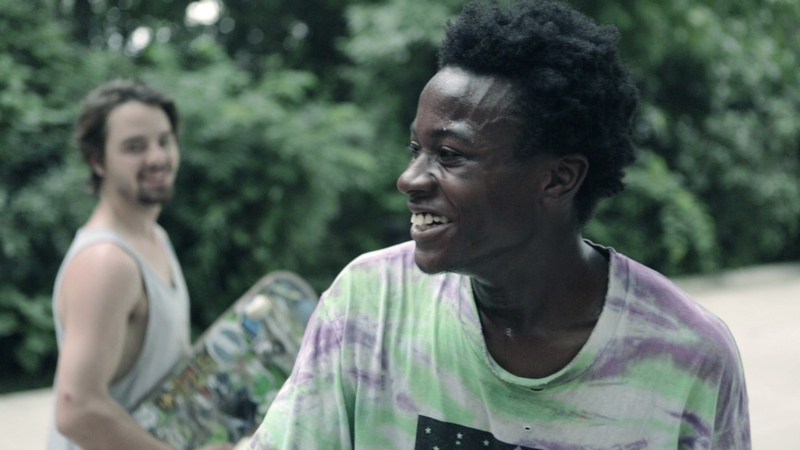 The carefree life of a skater glimpsed at in Minding the Gap’s graceful opening credits – which see’s Liu’s buddies glide effortlessly and skilfully around the fringes of the post-industrial city of Rockford, Illinois – gives way to the hardship all three young men have encountered and still wrestle with in their lives. Zack Mulligan – a guy barely into his twenties who seems to be perpetually chugging from a beer can – has been hit with a heavy dose of reality as his girlfriend is expecting their baby. Following the birth, the couple’s relationship grows increasingly strained, and Zack’s violent tendencies begins to rear their ugly head. Keire Johnson is an unassuming and good-natured black teenager who is struggling a little to find his way in life, compounded in part by the death of his volatile father years before. Liu himself has endured domestic trauma by the hands of his domineering, now deceased, white step-father. His mother, also subjected to abuse from her husband, appears in the documentary fielding questions from her son. Liu’s casually-placed camera and non-judgemental lens is able to gently probe the lives of his friends, and the results are often quietly compelling, and at times, unflinching raw. All three figures come across as likable, and both Johnson and Mulligan are refreshing self-aware when it comes to acknowledging the obstacles they’re encountered, despite the latter’s less desirable traits and his ongoing heavy-drinking. It’s a messy journey for all three at times, but Liu isn’t interested in ramping up the histrionics for the sake of injecting unnecessary conflict into the film. Liu’s low-key approach – helped immeasurably by Nathan Halpern and Chris Ruggiero’s gorgeous, willowy score – means a welcome intimacy is forged between the viewer and the subjects. It’s a testament to Liu’s vision and adaptability that he’s been able to take a film which began life as a series of quirky skate promos – some of which lurch into a Jackass-style melee – and transform it into a fully rounded and fascinating depiction of males lives blighted by the spectre of violence.